Zhao Liang has large hands: the new world's tallest man on planet earth? The large hand of Zhao Liang: World's Tallest Man? 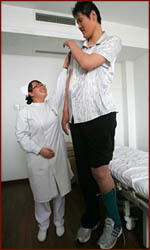 In april 2009 doctors in Tianjin, China, measured former basketball player Zhao Liang at 2.46m (8 ft. 1 in.) as the new world's tallest man! But officially Bao Xishun is still the Guinness World Record holder of the title 'tallest man' on earth. 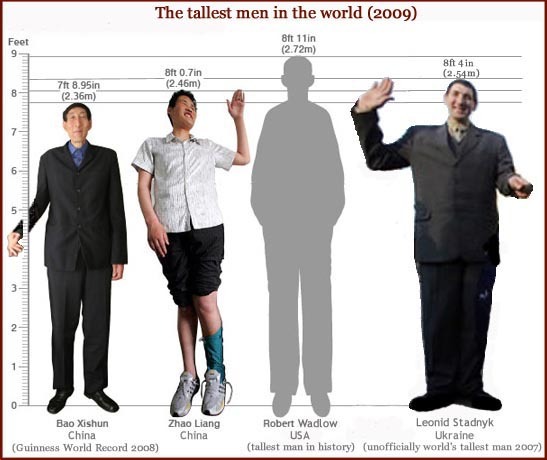 But both Chinese men are much smaller than Robert Wadlow (1918-1940) from the USA, who measured 2.72 m (8 ft. 11 in.). A report about the largest hands & tallest people on planet earth! Earlier this year Mr. Zhao Liang entered the Tianjin hospital for an operation to relieve pain from an old muscle tendon injury on his left foot. His height caused a stir among hospital staff who urged him to get measured properly. Mr. Zhao Liang's length was measured at 2.46m (8.07 ft. tall), making him 10cm (3.9 inches) taller than Bao Xishun, the current tallest man, who is 2.36m (7.9ft). For the past decade Zhao Liang had been working as a circus entertainer in Jilin province - perform magic tricks and play the saxophone and the cucurbit flute - but when he is recovered from his injury he has planned to contact Guinness World Records for claiming to be the new world's tallest man on planet earth! Zhao Liang's parents are of a more usual height, with his father measuring 1.8m (5.9 ft.) - which is quite long, the average length for chinese men is 1.73m - and his mother, 1.68m (5.5 ft.). Contrary to many other rather exceptionally long people in the world, Zhao Liang does not suffer on a medical problem. "He has a big appetite and can easily eat eight hamburger-sized steamed buns and three dishes for dinner. But I am so worried about his marriage, job and his health that my hair has turned white." Fortunately, Dr. Liu from the Tianjin hospital reported that Zhao Liang is in good health and he has no complications related to his height. At the photo below one can see that Zhao Liang's hands are very large - especially when compared to the small hand of one of the doctors at the Tianjin hospital. The tallest man in the world - a complicated story! In the history of human kind the American Robert Pershing Wadlow is known as the tallest man ever - and this is confirmed by Guinness World Records. Robert Wadlow's great size and his continued growth in adulthood was due to hypertrophy of his pituitary gland - which resulted in an abnormally high level of human growth hormone. He showed no indication of an end to his growth even at the time of his death. • Since january 2005 Bao Xishun, born in Inner Mongolia, is the owner of the official Guinnes World Record, titled: 'world's tallest man'. Bao Xishun claims to have been of normal height until he was 16 when he experienced a growth spurt for unknown reasons and reached his 'world record' height seven years later. • In september 2007 Leonid Stadnyk from Ukraine was officially recognzied by Guinness World Records as the new tallest man. At the age of 14 Leonid Standyk underwent an astonishing growth spurt after surgery on a benign brain tumor which stimulated his pituitary gland, which is responsible for stimulating the production and overproduction of growth hormones. His condition is known as 'acromegalic gigantism'. However, Leonid Stadnyk's length has been under dispute for his length was officially measured in Kiev by Ukraine representatives of Guinness World Records. In august 2008, Guinness World Records announced that the title of world's tallest man had been returned to China's Bao Xishun - after Stadnyk had refused to be measured under new guidelines, which required him to be independently measured by Guinness World Records adjudicators. • In april 2009 the new Chinese contender for the title 'tallest man' was discovered - a stated above! Though Zhao Liang has very large hands - in the perspective of his body seize his hand is not rather exceptionally large. And therefore the (unofficial) world record for having the world's "largest living hand on earth" still appears to belong to Leonid Stadnyk. A few other unusually large hands! • In 2007 a 24 year old macrodactyly patient Liu Hua from Jiangsu, China. He was born with a left thumb, index and middle finger much larger than normal, which grew dramatically together with his arm as he grew older. When Liu was hospitalized in Shanghai for surgical removal, his left thumb measured 26 centimeters, his index finger was 30cm and his middle finger 15cm. The overall weight of his left arm was about 10 kilograms - see the middle picture below. • In 2001 Duangjai Samaksamarn from Thailand visits Pattaya's Ripley's Believe It or Not Museum. Backthen her hands and arms were weighing more than 10 kilograms each... and still growing - see right picture below. • Leonid Stadnyk has the world's largest hand on earth! 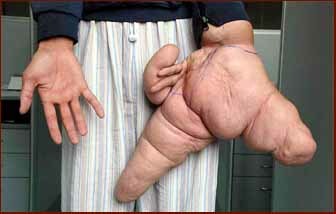 • Lee Redmond has the longest fingernails - a Guinness World Record! • Devendra Harne has 12 fingers and 13 toes - a Guinness World Record! • Usain Bolt has the fastest hand - a Guiness World Record! Find a Palm Reader in Ukraïne! Find a Palm Reader in China!